Review Summary: It's a bold attempt at satire with a great turn by Shukla, but the film fails to capitalize on an interesting premise! There is no drought (pardon the pun) of good ideas in this little, big film about an Odisha village that has no access to water. Soil re-mineralisation? That is unprecedented for a Hindi film. 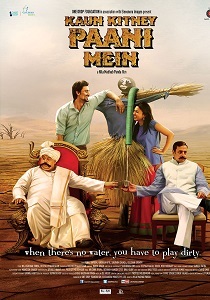 Kaun Kitney Paani Mein goes where Hindi cinema rarely ever does. For that alone it deserves to be seen. It’s not easy to sculpt a satire out of the raw material of misery.In a wretchedly poor part of Odisha there once lived a low-caste lover-boy who swoons over the zamindar’s daughter and pays with his life for his misplaced ardour. Not a sure shot recommendation, but Kaun Kitney Paani Mein makes an effort to be an eye-opener. The film has its moments of hits and misses so if you want to step out for a cine-watch that is not particularly commercial, you could watch this one! Watch it for Saurabh Shukla. Kaun Kitney Paani Mein could have been great as a short film, but is a bit too stretched as a feature.